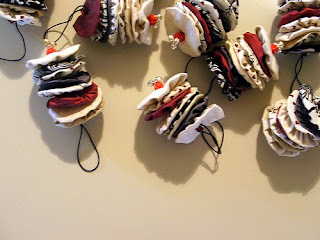 Sewn With Grace: Cutest Yo-Yo's! I can't believe that it's the Monday of the Christmas week. I still need to go and try to find a reasonably priced fly fishing rod for my son. He took up fishing last summer before heading off to college and just loves it. Even took his fishing pole to school with him. Now I love that! Something about him being in nature, close to God...okay, what on earth does that have to do with yo-yo ornaments. Nothing, but I am getting old, I lose track easily. SO, I was on Craftapalooza today and saw these adorable ornaments. I know that not too many of us are going to tackle this the week of Christmas, but I couldn't resist showing them to you. How cute is this? Keep smiling, be joyfilled! Very cute ornies! Merry Christmas and welcome to the SITS community! Very cute. I love doing yo-yos. Good handwork project. You are not old, I can't believe you have a son in college. You are too kind Beverly!